From education to work. This is the proper order of life. There is, of course, always a presumption that the education should be such as to prepare for the work. I need not point out how many centuries it has taken old England to get this presumption into its head. We are only just beginning to talk of technical education, and fortunately the failure of the Chancellor of the Exchequer to compensate publicans for the loss of their licences, has become the means to the first successful effort to provide common and widespread technical education for the people. In a scientific essay on this subject, it would be clearly shown that there is a logical necessity that education should be made to dovetail into the work to be followed in life. But life is not a series of propositions, nor a course of logic, nor a scientific scheme, but very often a medley of facts, which have to get adjusted by rough-and-tumble methods. These facts don't fall into kaleidoscopic adjustment and harmony. Sometimes these never come, and unwedded facts get jumbled on to the end, destitute of any fruitful issues for good. Other facts in other lives get adjusted, in spite, sometimes, of ugly and hostile surroundings, and then we see surprising issues, such as no scheme of education, preparatory to certain work, could have surpassed. But these things are rare, and leave the great mass of life so far unredeemed from the weltering incongruities of imperfect training. May it not be truly said that the world's rulers and leaders have strangely and logically blundered in their methods? Only just now, after all these centuries, is the training of the millions beginning to be felt as a primal necessity for all true and effective human developments. I began to work, but I could never see in what way my poor little bit of an education could prepare me for such as came to my hand. At that particular time (as I have since found from knowledge, but then found from experience) industrial and national matters, in 1839-1840, had got rather awry. It is true Queen Victoria had come to the throne after dynasties of confusion, corruption and weakness. She was a bright, pure presence, and her gracious looks and acts carried the promise of a reign whose beneficent depths and heights no statesman then foresaw. We know now she was a remedial and healing influence from the first. In nothing was her solicitude more active than in relief of the oppression of child-workers, and the poverty of the poor. No wonder her goodness, and her sanctified sorrow, made the nation, the empire, and even the world render her such a homage as the mere pomp of monarchs can never command. When the Queen came to the throne, work was scarce and food was dear. The Corn Laws were bringing into play their most cruel and evil results. One of these results was that little children had to compete for the decreasing sum of available work. As no Factory Act applied in the district where I began to work, the work of the children could be used as harsh necessity or harsher greed determined. We had an old neighbour, a kindly-disposed old woman, full of sympathy for her poorer neighbours, suffering herself, perhaps, a little less than those about her, and so willing to do what she could to help them. She had a son, Jack, who was an apprentice in a "pot-works" as a "muffin-maker." His mother, knowing the poverty of my parents, suggested I should become Jack's "mould-runner." It is necessary to explain that a "muffin-maker" was one who made small plates less than seven inches in diameter. Such a workman needed a " mould-runner." These moulds were a cast of plaster on which the clay was laid in something like the shape of a pancake. The clay was pressed by the wet right hand of the maker upon the plaster mould which was being spun round upon a whirling disc by his left hand. The plate-maker then got a wet tool which he pressed upon the clay, and by this gave the outer surface the required shape. By this tool, the foot-ring of the plate was formed on which it stands when used. When the plate had gone through those processes, the plaster cast on which it had been made had to be quickly carried away by the boy-help into a hot stove close by. Hence the term "mould-runner." This stove was a room four to five yards square, shelved all round at regular intervals, on which the plaster moulds were placed by the boy so that the soft clay plate just made could be dried to a certain extent. In the middle of this so-called stove-room was placed an iron stove full of fire, with a sheet-iron pipe carried into the chimney. It was no unusual thing for this stove and the chimney pipe to be red with the intense heat of the fire. Frequently there was no light in this stove-room but such as came from the glare of the fire. It was the mould-runner's business to place the plaster moulds on the shelves on their edge, slightly leaning against the wall, so as to get full surface heat, and to avoid damage to the soft plate on the moulds. To enable the boy to reach the higher shelves in this stove-room, a small pair of wooden steps was used. Up these he had to run for all the higher shelves, say one-fifth of the whole number. He had to run to his "master" with an empty mould, and return with a full one to the stove-room. This was properly called "mould-running," for nothing less than running would do. A boy would be kept going for twenty minutes or half-an-hour at a time, the perspiration coursing down his face and back, making channels on both, as if some curious system of irrigation were going on upon the surface of this small piece of humanity. The latest developments of irrigation in Egypt would not surpass that of the "sweat of the brow" and face and back of this boy. When so many dozens of the soft plates had been made, and had attained a certain dryness, the moulds were carried to the "master" to be tooled or "backed" on his whirligig, so as to smooth the outer surface of the plate. They were taken back one by one into the stove-room to be still further dried, so as to shell off from the plaster mould, and then the "green" plates were gathered in "bungs," about two dozen in each "bung," ready for "fetling." This "fetling " was the last process of the day's work, and a comparatively easy time for both "master" and boy, and very welcome, as both were exhausted by the long hard labour of the day. I should say there were regular intervals of change in the work when a "set" of plates had been made, and this interval was filled up by the platemaker and the boy "wedging clay", or making "battings." This "'wedging clay" was nominally the work of the boy, sometimes assisted by the platemaker, and the latter made the battings, that is, from balls of wedged or refined clay he made the pancake-like shapes of clay which he had to use in making the next "set" of plates. Wedging clay, for a boy, was as common as it was cruel. What is now done by hydraulic pressure was then done by the bone and muscle of, perhaps, a half-fed boy. He had to take a lump of raw clay upon a plaster block, cut it in two with a piece of wire, lift one half above his head, and then bring it down upon the lower half, to mix them, with whatever force he could command. This had to be repeated till the clay was brought to the consistency of something like putty. Doing such work as this was " rest " from the mould running. Imagine a mere boy, running in and out of this stove-room, winter and summer, with its blazing iron stove, his speed determined by his master's speed at his work. Coarse oaths, and threats, and brutal blows in many cases following any failure to be at the bench at the required moment. Thank God there is no mould-running or wedging now. Mechanical contrivances have done away with these cruel forms of child-labour. But such was the condition of life of thousands of youths "when I was a child," and the great humane Parliament of England, composed of lords and gentlemen of kind and beneficent hearts, never once thought of the little Pottery slaves. 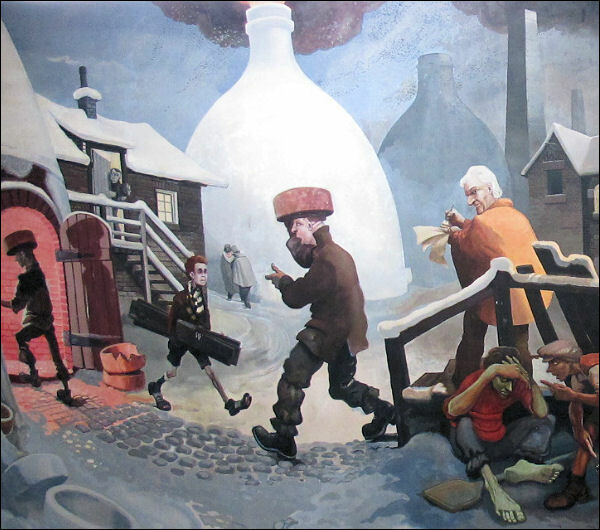 Something was done for the children of Lancashire and Yorkshire, but for those of the Potteries, either in pot-works or brickyards, nothing was done till many years after the time of which I write. While Elizabeth Barrett Browning was writing her " Cry of the Children " in heart-piercing words, I, and many other children, were making that cry in heart-piercing accents. That poem comes to me like a sort of poetic autobiography, written not with ink, but with bitter tears. Read that poem, and you have the inner history of English children sixty years ago as it could only be given by the sympathy and imagination of a great poet. Some poetry is truer than any " chronicle," however realistic. In the country of the free." But the lords and gentlemen of our district were deaf, and dumb, and blind. This mould-running, then, was my first employment. What affinity there was between it and my learning to read the Bible with ease at old Betty's school I never knew. No legislation of that day ever condescended to inform me, either. In fact, no legislation knew of my existence or occupation, and that of thousands of others, except, perhaps, one aldermanic legislator, who, through the glare and glory of city dinners in London, could hardly be expected to think anything of the condition of the childrenwho worked for him in the Potteries. Now, in these hard times of which I am writing, and as I was supposed to be clearly educated and ready for work, Jack's mother proposed that I should go and run moulds for her son. My wage was to be a shilling per week. For this large sum I had to work from between five and six o'clock in the morning, and work on till six, seven, or eight o'clock at night, just as Jack pleased. The earlier hour only applied to Monday night, as the potters had a devout regard for Saint Monday. This saint was the most beneficent patron the poor Pottery children then knew. On the other nights of the week work was rarely ever given up till eight o'clock, and it was followed until between five and six o'clock on Saturday. - at intervals of about four hours. There was another part of a mould-runner's business, not the pleasantest, which should be mentioned. The poor lad had to get a fire lighted in the iron stove before mentioned, so that work could be begun by six o'clock in the morning. Woe to the poor wretch who had not got his stove well heated by that time. If this were not so, words and blows fell thick and fast, and rarely did any employer ever trouble himself about this matter. The said employer thought it no part of his business to provide fire for the kindling of the stove fires. Boys had to go prowling about the "bank," as the "pot-works" was called, and pick up what they could of fire or wood. There were the "ovens" in which the pots were baked, one or more always "firing" night and day to bake the "ware" which they held. 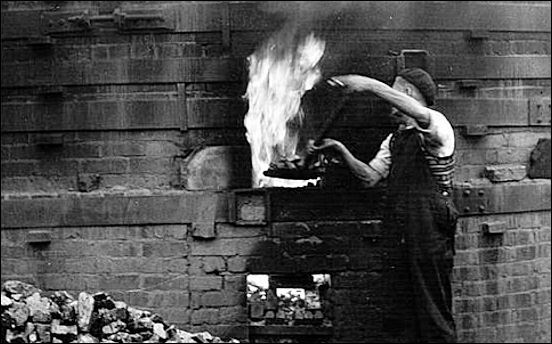 There were the "biscuit" ovens, in which the ware was first fired, and then there were the "glost" ovens, in which the glaze or enamel had to be burnt upon the pots. These ovens, with their fiery mouths, at regular intervals of space, were surrounded by "hovels," broad at the base and tapering upwards in conical shape, so as to form a sort of chimney for the smoke from the ovens. Boys and girls stealthily peeped through the doors of these hovels, and if the "fireman" was "getting a nap," or absent for a short time, a dash was made with a shovel at an oven mouth. But if the fireman caught such an unlucky wight, the fire would be quickly spilled, and he would be helped further than he had bargained for by an ugly kick. The fireman got exasperated by such an intruder, because he was afraid any disturbances of his fire might endanger the proper firing of his ware, and this was a very responsible matter. His responsibility often made him brutal. There were, of course, instances of rare fun, where a boy's tact and audacity would beat the fireman's utmost vigilance. This fire-hunting went on in all seasons of the year, in sunshine and in pelting storms of rain and snow. Shivering or sweating this hazardous business had to be done, and was done, with mocking laughter in success, or with howling torture in defeat. Every morning brought its peril for the poor mould-runner. I have seen sights of sickening brutality inflicted upon mere children, and yet such was the social callousness of the time that neither masters nor men thought of measures to do away with these cruelties. I remember after I had been working for Jack, my "master," for some weeks, he proposed one day that I should have a day's "play." This was the word used for a holiday. His reason for doing this was that he would save my day's wage of twopence. Poor Jack was no economist, or else he would have seen that if the thing answered for one day, it might just as well answer for every day. He looked simply at the twopence gained, and not at the pence lost by doing less work. So I was sent off" to play. I was nothing loth, and leaped at the idea of a day's play. It was in the spring of the year, I remember, and in the free sunshine and with roam¬ing friends I was happy. When Saturday night came I went, as usual, to Jack's home for my wages, for his mother always paid me out of what Jack brought home. He told his mother a very plausible story about my day's " play," in his simplicity making it out, truly enough, that it was no fault of mine. Upon hearing this the kind-hearted old woman placed a shilling in my hand, saying : "Here, lad, take the shilling ; it was no fault of thine thou played." Poor Jack! I shall never forget his face at that moment. More than sixty years have gone since then, but I shall never forget his confusion of face. What was worse for Jack was, that in my simplicity I told in the work¬shop that Jack's mother had paid me for my day's play. This brought upon him the laughter and banter of his shopmates. Jack took it all very quietly, and, to his credit be it said, he never blamed me for this, but I never got another day's play on such welcome terms. Mould Running - Boys were often employed as 'mould runners' which consisted of running in all weathers from one building to another. 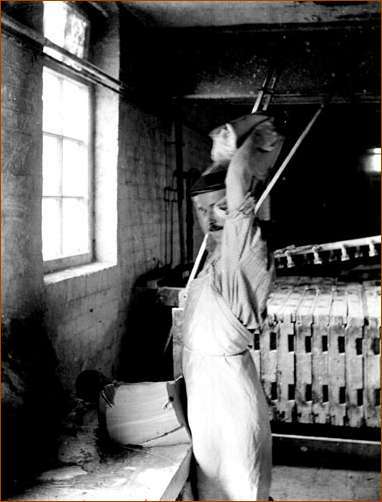 Clay Wedging - "some plate-makers even require their boys to what is called wedge their clay, which is a very laborious process, and consists in lifting large lumps of clays, and throwing them forcibly down on a hard surface, to free it from air and render it more compact. These boys are usually thin and pale, and frequently suffer from pulmonary and digestive diseases. Sickness prevails among them extensively."